She’s no stranger to Chanel, since she’s currently the face of the iconic French fashion house’s latest skincare collection and fronted an ad for Allure back in 1996. Therefore it was a given that the former fashion model turned actress would sport Chanel on the cover of Harper’s Bazaar Australia. The 38-year-old blonde showcases the dress from Chanel’s Resort 2015 collection to perfection with arms swung above her head, allowing the fabric to fall beautifully around her body (but no doubt with the help of a wind machine, let’s be realistic here). As usual, the magazine has received rave reviews for its efforts this month. “Bazaar Australia wins this round. A fantastic cover! It is nice to see them produce something so fresh and original despite the reprint covers they’ve had this year,” commented AL92, starting off the thread to a good start. “Love the image! The masthead could’ve been a different color, and I don’t like where her name is positioned, but otherwise it’s quite good,” noted Benn98. 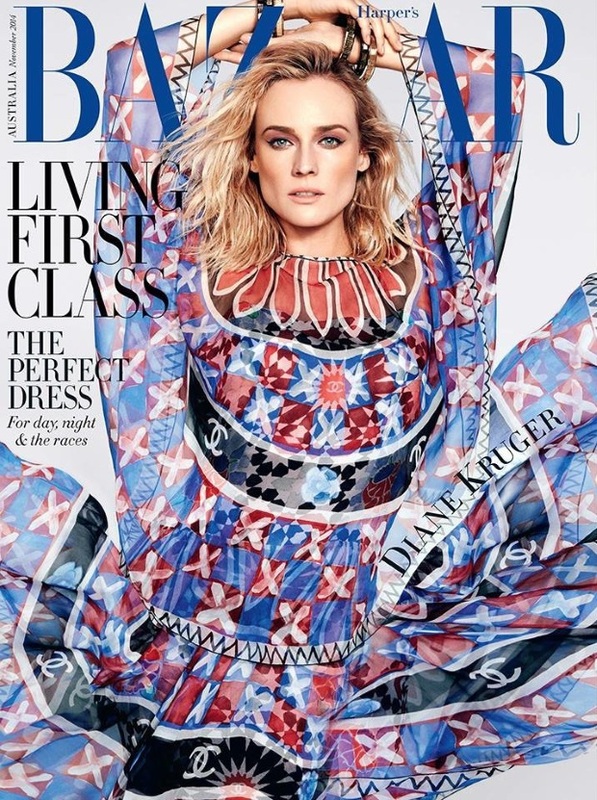 GlamorousBoy simply used the word “stunning” to describe Bazaar‘s latest installment. “Love it, Diane is so gorgeous! I quite like her show The Bridge so hope she talks a little about that,” enthused an excited visualoptimism. “Fresh cover! LOVE IT. Harper’s Bazaar Australia is following the same footsteps as Harper’s Bazaar Spain, very excited to see everything that’s inside this issue!” shared miguelalmeida. “Fantastic cover. I love Diane in this beautiful Chanel dress. Her pose amazes me too,” complimented narcyza, yet another admirer. It’s refreshing to read such positive opinions regarding a magazine cover, but do you agree? Have your say inside the thread here.